Celebrate the festival of lights, Hanukkah, with this elegant and charmingly designed glass and metal Judaica menora candelabra. 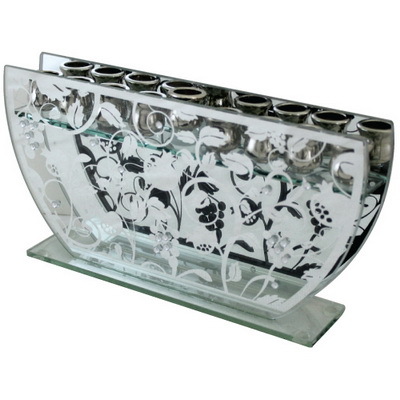 Nine candle holders (including the “shamash”) are raised above a transparent glass base and textured front panel, as well as stunning metal cutouts of Israel’s finest fruits. The holiday of Chanuka dates back to the era of the second Holy Temple (aka the Beit HaMikdash), which stood from 515 BCE to 70 CE. The ancient Assyrian nation attempted to conquer the Holy Land, and as part of their efforts, subjugate the indigenous nation, the Israelites, by limiting their social and religious rights. The Assyrians pillaged and defiled the Temple as a show of strength, but were eventually defeated by an army of Jews known as the Maccabees. Following the Maccabees’ victory, the Jewish people tried to restore the Temple and all of its functions to their former glory. The menorah was lit with only pure, consecrated olive oil - of the stores that had been defiled by the Assyrians during their occupation, only one jar remained. However, G-d performed a miracle and this seemingly miniscule amount of oil lasted eight days, until new oil could be obtained.